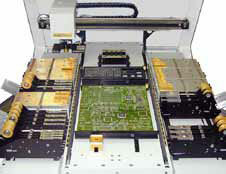 A Pick and Place machine is the second step in a paste, place, reflow assembly operation. 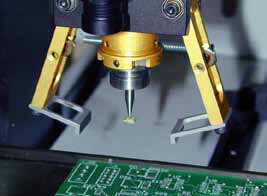 The “Place” function follows the “solder paste” function (stencil printer). The ‘place’ operation selects and delivers a component over the board and drops it into position. The simplest form of pick and place operation is by hand, that is, manually picking a component from a bin and, with the aid of a pair of tweezers and a magnifying glass, positioning it on the board and completing the operation with a hand-held soldering iron. This method works well if you are only doing occasional boards. Other things to consider – the size of the components (big or small) – affect the time required to hand place and solder. Fine pitch components are another issue, where more precision and accuracy are required, and the human factor comes into play. The work then become more tedious and time consuming. First, we will focus on machine-assisted manual systems for users interested in going from a couple boards a day to much higher production volumes. Fully automatic systems are complex enough that we’ll cover them separately. 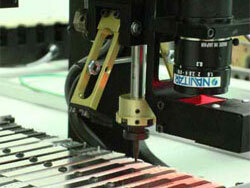 Check out DDM Novastar's wide range of Pick and Place Machines. Let’s start by addressing production ranges for various types of machine-assisted manual systems. For purposes of comparison, since all circuit boards vary in size and complexity, we’ll talk about volumes in terms of components per hour, or CPH. This will help you to decide what level of automation you’ll need. On the very low side of the scale – using a manual hand system – the only expense is the appropriate hand tools for non-machine assisted manual placement. At the high end of the spectrum, these machines are often modular or customized for high speed unattended operation. Buyers in this market are likely looking more at ROI than initial cost. A machine-assisted manual system can be equipped with features such as an X-Y indexing table with vacuum pickup head or pen; ergonomic fixturing to help relieve operator fatigue; and additional fixturing for θ (rotation) and Z (height) positioning in addition to X and Y. In most cases, machine assisted manual systems can be purchased with just the bare necessities, and desirable options can be added later as they’re needed. Today there are very few semiautomatic machines still being made because of the increasing affordability of some of the more automated systems on the market. They were originally introduced at a time when the leap from manual to fully automatic systems was just too cost prohibitive and were made available with some features to assist the manual operation. 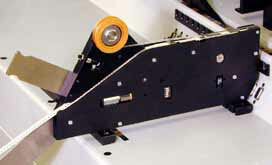 More correctly referred to as “enhanced manual” systems, semi-automatic pick and place machines typically include a computer interface with a vision system that shows where the components go, but the placement itself is still done manually. This type of machine helps the operator position ultra-fine pitch components more accurately for low-volume applications, an operation that is very difficult to accomplish using a simple machine-assisted manual machine. Most pick and place machines will handle a fairly wide variety of board sizes, with a work table designed to accommodate boards up to 16” x 24”. There is also ease of control over the components, which aids in accuracy, along with a simple learning curve. In most cases, no training is required. Don’t overlook electrical requirements. Make sure the machine you buy will plug-and-play in your environment without pulling in new wiring or else plan on an adapter/transformer. We will start by talking about two aspects of machine capability – accuracy and repeatability, and Pick and Place centering methods. For production machines, we typically recommend looking for a machine with accuracy of +/- .001” and down to fine pitch capability of 12 mil on a repeated basis. Less expensive machines often don’t meet this spec, so that’s something to be aware of. Most low-cost machines will also not come standard with a computer or software which could help with the repeatability aspects if not the accuracy. While some may offer enhanced technology – most do not. 1. Method 1: No centering mechanism other than relying on the component’s pick-up point for placement. In other words, the part is not physically centered after being picked up by the tool head, and if it’s picked off-center on the tool, it will be off-center when placed on the board. This is obviously not a very accurate placement method because there is no definable tolerance. You can expect to find this method used by hobbyists or instructors, but certainly not in any type of precision production environment. There are not many options available either, and long-term reliability is questionable. b. Cons: Low accuracy, repeatability and long-term reliability, no options, or spare parts. 2. Method 2: Mechanical centering jaws or fingers In this method, the component is picked up and moved into its center position in the X and Y axes on the pick-up head. Typically, this method is easy to set up and repeatable within +/-.001” accuracy. This centering method is generally found in low- to mid-range machines. a. Pros: Easy to learn and set up; repeatable; one of the fastest method currently available; a true “on-the-fly” system; low cost. b. Cons: Physically touches the component which may not be appropriate for certain types of parts, especially those with delicate leads. c. Size range: 0201 packages up to 35 mm square. 3. Method 3: Laser centering In this method, the component is picked up inline with a laser beam which detects the component’s center position on the tool head and recalculates the zero point of the part according to its position in the X, Y axes and rotational position relative to the head for an accurate placement on the board. a. Pros: Touchless; on-the-fly (similar to mechanical method). b. Cons: It is less reliable. There are limitations on the types of parts it can handle, such as very thin components (If .050 thin, they may need to be reset because of part variations, even from the same vendor); requires longer setup time, since the Z axis (part thickness) must be defined; more costly than Mechanical Centering, but about the same as Vision. c. Size range: cannot center parts below 0402 packages or larger than 35 mm square. 4. Method 4: Vision centering Here, there are two types, Look-Down and Look-Up. Look-down vision will view the top of the component prior to picking it up for its pick-up location. It then calculate its center, compares it to its image file from the stored database, then picks up the component and transports it to its position on the board. a. Pros: True touchless centering; can handle odd-shaped and delicate components; Look-Down Vision Centering placement is accurate to +/-.004”. 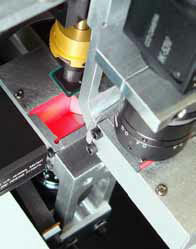 b. Cons: Typically longer setup times due to the need to teach the vision system how to identify part images which are stored in the machine’s database; a slower method of centering due to time slice required for processing; Vision is more costly than the mechanical method; for Look-Down vision, the part may move from its pickup point to its placement on the board. The Look-Up Vision method is the most accurate centering method available. The component is first picked up from the pickup area, moved to a camera station that looks at the bottom of the component, and calculates its center position. b. Cons: Typically, a longer setup time due to the need to teach the vision system how to identify the image, stored in the machine’s database; a slower method of centering due to processing time; Vision is more costly than the mechanical method. The Pick-Up and Centering Method you choose will have a great deal of influence on the quality and speed of your production needs, along with how to relate this accuracy back to the machine. But, that’s just the beginning. To review, when starting the evaluation process, there are two defining factors to keep in mind which determine what category fits your machine needs. The first principal factor is CPH (components per hour), and the secondary factor is machine capability. While it’s constructive to start by understanding how production rates affect the type and performance of a pick-and-place machine, please refer to the prior two chapters for those ranges. Machine capability is the second defining factor in helping choose the correct auto pick and place machine for your needs. In this chapter, we will address three aspects of machine capability that have a direct impact on final board quality and production yield. Method 1: No positioning feedback loop In this system, the motor drives the part to a location on the board defined in the program by the number of steps in each X-Y axis, but there’s no way to tell if it actually ends up in the right place. These systems use stepper motors for positioning. 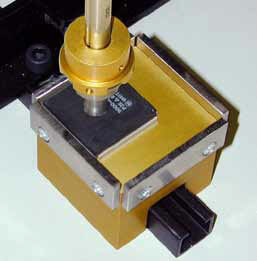 Method 3: Positioning with linear encoder In this method, linear scales are mounted to the machine’s X-Y axes table and an encoder is mounted on the traveling beam that will be carrying the components. This method will report its actual position back to the control system and make corrections to the position programmed, if needed, to within a few microns of actual X & Y location for the component placement (which is typically 12,800 increments – or steps – for each inch of travel). The best machines in the this category uses servo motors. NOTE: The quality of the encoder (the position feedback sensor), is an important element in the whole system and does affect accuracy. When selecting a pick-and-place machine, you should be aware that its construction will dictate its effective CPH range and footprint, including considerations for the number of component feeders it can accommodate. 1. 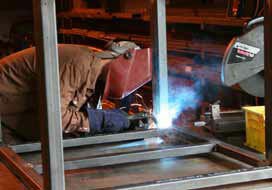 All-welded steel: The most accurate machine will have a frame that is constructed of solid welded structural steel tube. This provides significant stability necessary for accurate positioning and high-speed movement of X & Y axes. This construction method is recommended for ANY production environments, and it will remain stable without requiring ongoing calibration. Any pick and place machine should be capable of offering fluid dispensing systems. Most common liquids include solder pastes, adhesives, lubricants, epoxies, fluxes, glue, sealants, and more. This is a valuable option when building prototypes or one-off PCB assemblies that do not warrant the cost of a dedicated printer stencil or foil. If the machine’s production will be dedicated to a small number of components and type of job, it’s very easy to identify the number and type of feeders. However, that is not usually the case with contract assembly shops, since they don’t know what type of board and how many different components the next job will require. Some OEMs also need flexibility for a wide range of board configurations, especially if they intend to use the same machine for prototypes and several different production boards. So, it’s useful in those cases to consider a machine with the greatest number of feeder position and options that can accommodate the footprint your space can handle. Cut strip holders are usually associated with the low volume world. 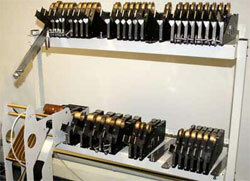 Matrix tray holders are used for components that are not available on tape. Tube feeders dispense components supplied in tubes. Electric tape (and reel) feeders are usually more costly initially, but offer the best long-term investment. Electric tape feeders are available as single units in a variety of sizes, and cover the range of 0201 components up to 56 mm large components. Many manufacturers now offer a multiple feeder (known as bank feeder). These are available for 8 mm tape, and can come with up to twelve 8mm feeder lanes per unit. Since components are packaged in many forms, e.g., discrete components on tape, quad packs, matrix trays, tubes, cut strips, etc., your choice of feeders would depend on your production but also on any size restrictions you may have. A good starting point is to purchase the most feeders you can get in the footprint you have available. Because small to mid-volume assembly operations must switch projects often, ease of setup and use is a much more important factor than it is for large volume operation where a single setup may handle a run of hundreds of thousands of components. The job-shop assembler must be agile enough to switch among a wide range of board sizes and component selections quickly to meet a variety of production demands. The machine must also be able to handle a broad range of component sizes, from very small to very large, without a strain on setup and testing. In contrast, large production machines are often made up of several modules of pick and place systems, positioned in-line where they’re needed most for fine pitch parts, chip shooters, or optional tasks. This allows the high volume producer to customize a line to optimize production speed, efficiency and quality. In these environments, a longer setup can be tolerated, because it will be made up in production efficiency. Does the model you’re looking at come with a computer, or just the software? This is neither good nor bad, since some users prefer to install the software on their own PCs; however, a fully integrated system assures there will be no software compatibility issues, and this can streamline the installation and setup. Does the machine run on a familiar graphical user interface (GUI) such as Windows™ or a proprietary system? Most every operator will be immediately familiar with the intuitive interface of Windows conventions, a key factor in accelerating usability, particularly for a new machine. A proprietary GUI may require a longer learning curve. For machines handling over 8,000 CPH, expect a higher learning curve because complexity increases significantly. 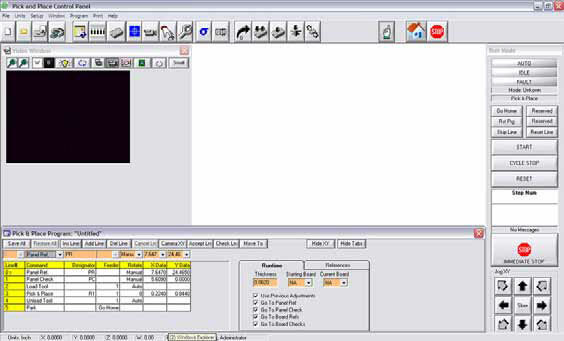 An important utility to look for that gives the custom assembler great flexibility is a Universal CAD Translator function (UCT). The UCT allows users to import the pick-and-place data to the machine’s database to help create the program and scale it. When a project is begun, the user selects the program to run from an archived set of files. This permits quick change over from one board to another since all the programming is memorized. 01. Text window displays the file to be imported and its location /path. 02. Pressing button opens window to allow user to change the CAD file to be imported. 03. Displays the folder to which the converted file in the .prg format will be saved. 04. Press Browse opens window to allow user to change location in which the folder for the .prg file will be saved. 05. Default name of exported file. Can be changed by editing in this text box. 07. Top- if selected/checked, the top side component placement will be imported. 08. Bottom- if selected/checked, the bottom side component placement will be imported. 09. Displays filename and path/location of the file after importing is completed. 10. Input File Preview Filtered (up to 50 lines). 11. Character entered to ignore unnecessary information not required for the .prg file. 12. Enter the number of lines to be ignored from pick & place CAD during importing process. 13. Using either cComment Char or Ignor Lines displays file in preview window without comment lines. 14. Displays file in preview window in its original format (including comments). 16. Displays program lines that will be imported from the user defined selections. 17. Displays lines actually imported. 18. Displays lines not imported in .prg format. 19. Displays number of lines the UCT processed for importing the file into the .prg format. 20. Adds angle to each placement. Another feature to look for is a master feeder and component database. Once the operator stores component data, it’s there forever and can be accessed and imported into any new board configuration setup. This database grows as you add components, so over time, you’ll spend less time programming and more time producing. Often, the database will remember inventory, so as you use components, the remaining stock will always be available to check. This is a great feature for scheduling and inventory planning. Be sure to see if the system you’re considering only stores data for particular boards rather than an entire component database. If so, it will only remember specific board component data, and it won’t show all available inventory. Certain utilities are often provided with a well-designed machine to aid in setting up and programming the system. One of the most important utilities affecting optimized performance is offline software. 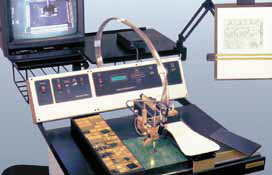 Offline software allows the user to simulate the pick and place machine’s routine in a remote environment for programming. It can be installed on any computer and looks just like the machine’s GUI. It allows the user to manipulate the program to sort functions and modify program lines for most efficient use and speed, for instance, by aggregating like-type components in the same sequence, minimizing tool changes and the time it takes to perform those functions. It can also create board references for multi-boards prior to running on the machine. 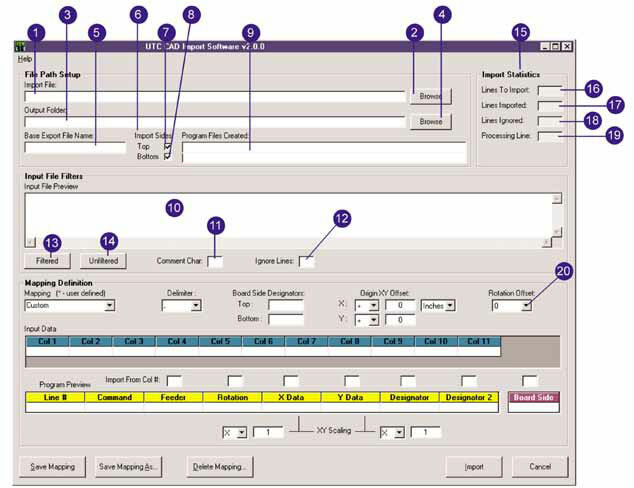 To speed job change-over, software interface should include sub-routines for common operations such as setting up matrix trays, identifying strip feeders, and teaching for vision centering. Expanding on the last point, image interpretation should be clear and straightforward; if it isn’t – and the machine has a hard time recognizing a component – the result could be a misplaced component, resulting in a lot of unnecessary rework. A well designed software interface will capture a range of image qualities for each component type that are all representative of an acceptable part, and store it as an approved file. This improves speed, repeatability and efficiency, and final board quality. Availability of on-site or factory training? Remote diagnostics – can your vendor provide this via online support? Critical software updates – Do they come free or with a cost? Is the software interface available for pre-sale review? When evaluating any type of SMT machine, consider factory support as one of the most important assets of your purchase. The best way to learn how a company treats its customers is by word of mouth. Talk to several customers to find out how happy they are with the machine, the seller, and the support they provide. Where is the manufacturing plant? Can they help troubleshoot alignment issues over the phone? Do they offer field service? Do they have spare parts in stock for immediate shipment? While there isn’t much of a used market for manual, machine-assisted or enhanced manual pick and place machines, it’s still a good idea to ask your supplier about their older machines in the field, and if down the road, spare parts are available, and about their capability to customize a spare part if the machine becomes obsolescent. Ask what the expected life-cycle of the product is. The industry standard is seven years. Remember, there is a difference between a true manufacturer and an equipment supplier or distributor. Click here to contact DDM Novastar for information on Pick and Place or other machines. Download the PDF: "Selecting a Pick & Place Machine"